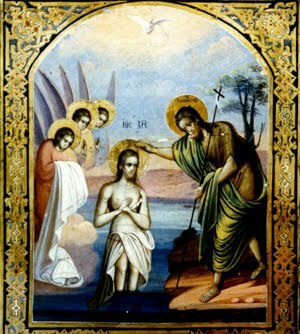 Today we celebrate the Baptism of the Lord. 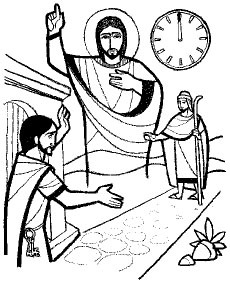 Jesus makes his way to John the Baptist and in a turn about, has John baptize him, the one who has come to save the world. John’s mind must have been reeling at the thought. As someone who was baptized well into adulthood, I can tell you that even in the most normal circumstances, the process of baptism is life-altering. One enters into the life and death of our Lord in a way that feels in the end like a great weight is removed from one’s heart. I think the best explanation of what that feels like is akin to the first reading in today’s mass, Is 40: 1-5, indeed what is said in Mt 3:3 is from this passage in Isaiah. For in our baptism, indeed we feel the sudden peacefulness and the sudden comfort of a great weight lifted from us. The Spirit of God has come upon us, and now our way is easy. We have the help of God. Our mountains and hills of life are made low, the turns of twists of everyday life are made plain, the world is no longer a desert of dry day-to-day purposelessness, but is a fertile world of joy and bounty. Hope is ours, peace is ours, joy is ours. Of course that doesn’t end our ups and downs in life, but it does give a structure to them that makes sense. We can place the inevitable woes of life into perspective. We know who we are and what we are and where we are going. That is our rock and upon it we place all the vicissitudes of life, knowing that all shall work out for good in the end. It is unfortunate that most people experience baptism as an infant, I think. 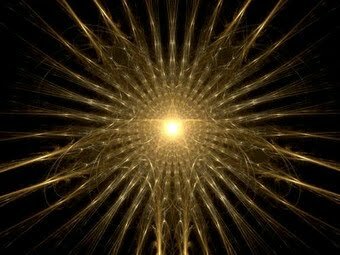 They are of course unaware of what has happened to them, and they miss this wonderful experience of awe and wonder which comes from a mindful understanding of what is occurring. Yet our experience of remembrance of the Lord’s baptism is our time to recall the gift given us by a loving and gracious God. In placing ourselves in that place and time, we can but imagine the awe that overcame those in attendance. Imagine if you can some mighty movement of the heavens, sufficiently impressive to get your attention and cause you to gaze upward in expectation and wonder. Or is it that we hear but faintly within “you are my beloved daughter, with you I am well pleased.” Is that the echo we truly hear when we contemplate this wondrous event that is the centerpiece of our faith–Jesus Christ. Let us make it a regular practice to recall this time, this lifting of the burden of going it alone that so plagues us and so limits us. It is that which makes us stubborn and selfish, angry and short-tempered. We are not meant to be solitary creatures. We are made for community. The first community we enter is that of the Trinity. I once did a paper on the treatment of light in the bible. Phos as it is known in the Greek. But the word light has played a significant role in our existential thinking for times well before the generation of the bible, and is not limited to those who espouse a Christian doctrine. I had to laugh this morning as Father remarked upon Plato and his statement that most of mankind conceives of reality about as clearly as our ancient forefathers watched shadows play against the wall of the cave. Father said in all sincerity, “for a pagan, Plato had a real insight!” Indeed he did, and perhaps he wasn’t quite the pagan you think he was. 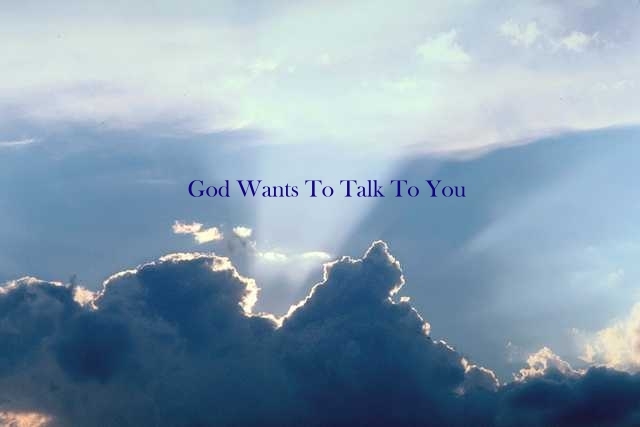 God speaks to all peoples in all times in ways that are conjunction with their time and place in the world. As we struggled to free ourselves the “dark ages” which were admittedly only dark for some, we came into the “Enlightenment” that time when we began to see that things that we thought were mysteries of God, were explainable through human reason and study. In our first reading today, Isaiah speaks of the light that is coming to Israel, a light that will be recognized, a light to be followed, and in following, the world will become rich. Of course Isaiah 60: 1-6 is thought to predict the coming of the Magi, who located the Christ child in Bethlehem and recognized him as the light that would lead his people as King. And indeed, we often refer to Christ as light. Reading the first chapter of the Gospel of John assures us that Jesus is the light that brings life, the light that dispels the darkness. Light in the Gospel and certainly among the Gnostics was akin to knowledge. 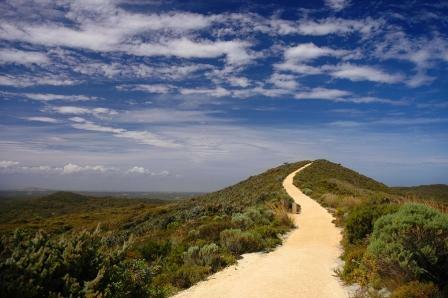 In his person, Jesus brings true faith, he proclaims the true and direct path to God. He brings us the knowledge of things heavenly, things that cannot be grasped by reason alone, but through faith. That is the message for us today as we celebrate the Epiphany of the Lord. Jesus comes into the world, into our personal world and offers us the light of knowledge. If we abide in him and in his teachings we live in the light. That allows the Spirit within us to guide us along the path of truth–the sure path to God’s loving embrace. Now of course, many claim to follow Jesus. And many claim that others who make such claims do not in fact. How can we know? There is no easy answer to this question. To be sure that one is doing the will of God, following the dictates of the Christ, is to almost always to fall into error. Those who profess that they have the “true” knowledge almost assuredly do not, and perhaps that is the hallmark of a false prophet. Humility is the first hallmark I believe of living in truth. One must be ever ready to conclude that one has been wrong. One must be ever ready to read further, more deeply, and to struggle in prayer for a clearer understanding. We must implore God at every juncture show us our errors and lead us back to the straight road. We are all to enthralled with crookedness and we must keep that before us. In reading the various things that Jesus said, or more correctly what was reported he said, we must look to the overarching theme of his dialogues. And of course, I explain nothing new when I suggest that the overriding theme of Jesus as love. Love of God, love of neighbor. One can never isolate a sentence or word from scripture as proof of anything else. It must be placed in the context of all that he said, for in the end we must confess that those who set quill to parchment lo those millenia ago were human and in being human they brought their own reason and history to their understanding of what Jesus meant. That may fly in the face of some who claim that the bible the result of God directing perfectly the hand of the writer. The evidence doesn’t suggest that that was so, nor does logic if you think about it. If God dictated it, then well, I confess, God is and was not much of a writer. And besides, being a literalist simply is an easy way out. As is the claim by some that God meant for the average person, with no special education, to understand everything in it with ease. This leads to private interpretation and quite obviously is why we have tens of thousands of so-called Christian sects this day. No those who claim that the bible is easily interpretable by anyone are surely just making life easy on themselves. Tens of thousands have spent a lifetime studying sacred documents, and they certainly make no such claims. The bible is complicated, perhaps as complicated as any “book” can be. So we tread carefully. But with care, and attention, as I said, it is possible to see the broad foundations of Jesus’ teachings. We know that love, companionship, compassion, respect for our differences, embracing the poor and disadvantaged, respect for those we disagree with, service to others–these are the attributes of those who follow the Lord. With humility, curiosity, wonderment, awe, and joyous happiness, we go forth seeking the road and seeking to stay upon it. 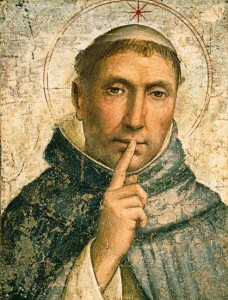 I suppose you can just as quickly come to the question of the age-old Protestant-Catholic dispute about justification by faith or by works. Indeed, I used to read about that controversy a lot, and I studied the issue, and suddenly with perfect clarity, the answer seemed obvious to me. We are indeed justified by faith alone, but it is the outward manifestation of good works that announces to both ourselves and the world that there has indeed been an inner conversion. In other words the willingness and desire to do good works bespeaks that the conversion is real. We, in this country, are mired in a war of religious doctrines and opinions. We are notified by the “Religious Right” that they have rightly understood God’s wishes and are determined to implement “for the good” of the world, whether the world agrees or not. They believe that they have the correct determination of scripture, and the correct extrapolation into today’s complicated and intricate fabric of society of what is “right”, what is “good” and more importantly, what is “evil”. They preach sacredness of life. They preach sacredness of family. Somewhere in there, they conflate the bible with government and conclude that God desires us to have certain freedoms, though I am hard pressed to envision God as wanting us to have a right to have weaponry on our hip as we enter the supermarket. They define those points to us as well. Life is actual biological conception. They tell us that life “starts” there. They tell us that under no circumstances can we interfere with that life. We must bring it to birth. Those who are “intellectually honest” if there is such a thing in the religious right, make no exceptions. Life for them is reduced to a zygote with “potentiality”. If you ask them if they are willing to support medical care for pregnant women, prenatal vitamins, housing, clothing, food allowances, they are not so sure. If you ask them what steps they are willing to take to support that new life, such as day care, and food, enrichment of the environment, well, they are not so sure. If you ask them about quality schools for the disadvantaged child, health care, and cultural enrichment, they begin to wander away. If you ask them about health care, mental health care during adult life, senior health care, housing, food, and so forth, they are shutting you out and down the street. Life has been reduced for them to this moment in time when sperm meets egg. If you ask them to define family, they surely will. They will tell you that it is a man and a woman and their natural offspring, or perhaps adopted children. Nothing else is family. Religious men and women who live in community are not “family” nor are gay men and women living in monogamous relationships, even when those relationships are decades long and evoke exacting the hoped for caring and support that they would desire in that “traditional” family unit. They will preach family values while accepting that they themselves and their friends have been married multiple times, given birth out-of-wedlock, engaged in adultery. They will admit to being sinners, yet still accord themselves higher status for preaching a doctrine that others find odious and stifling of true human dignity and that they themselves have not practiced. Jesus points out that the literal “laws” as given by Moses, fall away in the face of God’s overreaching law of love and community. We are to love each other, care for each other. When we go beyond that to presuppose God’s desires in our modern world, declaring that some are bad and evil for not living up to our “moral laws” too often those moral laws are nothing more than human precepts, human traditions. We need to stop being preachers and become livers of the faith we claim. We teach by example much more successfully than we do by word. It is the life well lived that is emulated by others, that others look up to as models for themselves. And there is nothing to admire in the person who lives one way, and dodges the issue by proclaiming himself a sinner, thereby absolving himself and giving him the right (so he thinks) to condemn others. If you knew the truth, you would live it. To proclaim it only is not to begin to know it. There aren’t many people who can’t tell you exactly how many days there are left before Christmas. That’s because time is running, and there is still so much to do. Menus to be finalized, food to be bought, baking to get done, presents to be bought and wrapped, cards to address, decorating to finish. And so we limp into our places of worship this Sunday, and what an uplifting message we get. Just exactly when we need it. And it comes, with a fanfare of trumpets blaring. Listen. You can hear them. 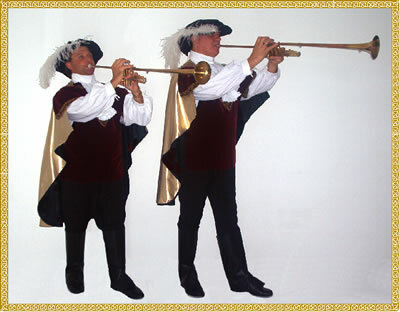 Just like in movies of the times of merry old England, and certainly in those times in Rome when the Emperor was about to arrive, the trumpets were heard upon the ramparts. The Good News is on its way! Rejoice, we hear again and again. Rejoice. We have been blessed with a God who listens and who responds to our call. From Isaiah we are told that glad tidings come to the poor, the brokenhearted will be healed, the prisoners will be released. In the Magnificat, Mary rejoices that God will fill the hungry with good things and will have mercy on every generation. Paul says we all will be made perfect because our God is faithful and it will be accomplished. John reminds us that we may believe all this because John the Baptist told us so. He told us that he was the one coming to announce the coming of the Light. Such a word was known to Jews. Light was knowledge of the Lord, yet here it is used in a new way. Light is God and that God is coming among us to perfect us, and to heal and to have mercy. God as Light will teach us. John the Baptist may indeed be a prophet of the Good News. But Paul warns, “test everything, retain what is good”. Paul is of course speaking after the fact, and is reminding us that we know what Jesus taught. Examine all that is given by so-called prophets in that light. Retain what is good. In other words, lay everything that is preached to you alongside the teaching of the Light, and keep only that which aligns with the Master’s teaching. Would that that occurred today. Today, we unfortunately have a plethora of spokespersons for the Light. And too many of them, sad so say, have messages that in the end serve to further other agendas. They seek to serve political parties or perceived ingrained beliefs that may have little or in some cases, nothing to do with what our Master taught. When someone tries to tell you that Jesus would be for a certain economic ideology, by twisting a parable or taking a sentence all too literally, beware. Test everything. When someone attempts to tell you that Jesus would be of this or that position in regards some sexual moray, beware. Test everything. Prophets abound even today. And some are indeed listening to God, but some are not. Retain what is good. Test against what the Light proclaims. What is warm and life-giving? What opens up for all to see? What offers hope, healing, mercy? What on the other hand is dark, divisive, and fearful? Reject it as not light. It is this good news that will carry us through the days and hours to come. It is this which sustains us through real and perceived obstacles and the dark. A new day is dawning. Come to the Light! What More Was There to Do? 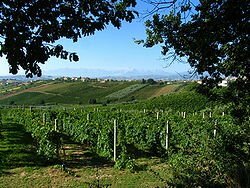 We are all of us fairly familiar with the parable of the vineyard owner who leaves his lands in the hands of tenants only to have the tenants attempt to hold the land for themselves and not return the profits to the owner. We learn early on in our religious lives that the owner is God, the tenants are the Pharisees and Sadducees of the day, and the servants who come to collect the harvest are the prophets who have throughout the years warned Israel to turn from its wicked ways. Finally of course the Son goes to collect from the tenants and is murdered. It is not lost on the listeners that the Son is none other than Jesus himself. Simple isn’t it. We, the Gentiles or modern-day Christians, are the recipients of the Kingdom, given to us when God “gave up” on Israel. We can nod with a smile, and go home from church feeling pretty darn special. We would do well not to rest on our assumptions too long however. If parables are living words to us today, as I believe all scripture is, then we must stop and think. Are we the Pharisees and Sadducees of our day? And we must ask ourselves? Not what more should God have done but what more we should have done. If we look upon the kingdom and find it full of wild grapes, who is to blame? God? Or ourselves? Are we unworthy tenants as well as so many of those early Israelites were? Or are we the wild grapes themselves? Neither prospect is particularly enjoyable to contemplate. Rather than feeling self-satisfied as the new “inheritors” of the vineyard, we should examine our lives and works most carefully. When Jesus returns to take back his Kingdom, left in our hands, lo those centuries ago, what will he find? How will he find us? Will the books balance? Will we have cared for the land and kept it fertile? Will we have made sure that the workers are healthy and strong, able to raise future generations of good workers? These are important questions, and no doubt not a single one of us can feel secure that we will pass the test. 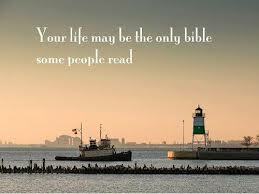 But if we have read scripture with care, we know that all is not lost if we find ourselves short of our goal. God is loving and forgiving and forever calls us to begin again, to get up and try once more. If we do that with sincerity and with good heart, we can be assured that Jesus himself will join us with clippers and baskets and together we will create God’s kingdom in perfect glory. How do we define God? Humankind has been asking that question since the first human entertained the thought that there was some entity beyond himself. No doubt Christians are directed to an answer in the first creation story, where the writer announces that God has made man in “our” image. We took from that, simplistically, that God must look like us, and certainly if one looks to Michelangelo’s Sistine Chapel, one would agree. God indeed is just a “super” man. And one thing generally leads to another and in this case, we naturally found it easy to conclude that God thinks as we do, and well, wants what we want. Given that as humans, we all want a lot of things, I suppose that once in a while some of us hit the mark. Isaiah reminds us that when we try to make God think as we do, we are surely in trouble. Sadly, we seldom remember that warning. We all too often assume that God is understandable in the same way that we understand our spouse, our children, or our boss at work. We think that God not only thinks in the same manner that we do, but we ascribe the same emotions and psychological motivations to the Godhead. We may not always do this consciously, for we do remember Isaiah, but subconsciously, we almost always forget. We think God is rooting for us to win the tennis match, and that God is pulling for us to get this job. We tend for forget, that at the other end is our tennis opponent, and someone else in need of a job, and that they are operating under the same assumption. So is God choosing between us? Hardly. God has no favorites, according to Jesus. God only uplifts and calls us to become the greatness that has been present within us from all time. According to Jesus, God is about love and justice. He is for raising all of his children to their perfect potential. In infinite wisdom, if we each perform to our best ability in all things, then naturally all will work out for the best. The more physically capable on a given day will win the match, the most qualified, the job. There is nothing unfair in this. If we lose, we can practice more, or we can seek more training. Or we can find a more suitable recreation or job, one that we are most qualified for. God is about global, or intergalactic things, not our silly preference for this team or that to win a contest this Sunday. Of course it’s just not a matter of “the just thing will win out.” There are plenty of other variables that sometimes must also align. That is part of life. Bad things happen to good people. Still, by not expecting God to grant our “righteous” request, we don’t place upon God that which is not his burden. We don’t declare ourselves still “too sinful” to succeed and redouble our prayers and spiritual regimen. We seek the true reasons for our failure and do what we can, if we can, to correct them. Are you seeking the superman God or some other? ” What God are you talking about? What these readings have in common is process. We sow seeds, rain falls, crops grow and are harvested. Even the reading from Romans suggests that process is the key. Creation is a process that is being worked out in time. 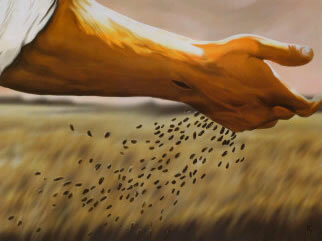 Typically, what is garnered from Matthew’s parable of the sower, is that we must be the fruitful seed. We must take the Word, let it enrich us, grow in us and we must then use it to facilitate the creating desire of God. And that is perfectly true. Yet, it also bespeaks something about our faith and how it prospers or not. I often wonder how a fundamentalist reads this parable. Surely they don’t see themselves as seed that has fallen on rock or the path. They see themselves as seed that fell into rich soil. They do not let the cares of the world, or the vicissitudes of life interfere with their dedication to Jesus and the Gospel. They remain committed to their understanding of the Word. But I suggest there is another way to look at the parable and the readings in general. They don’t necessarily relate to one’s tenacity in committment to “spreading the Word” but rather to the process of being in faith. And what we see here is change. There is a process being announced. Seed, rain, soil, each is needed. The seed bursts forth, becomes a plant, sets seed, produces its fruits, and then is harvested. It’s not simply a matter of sowing day in and day out. 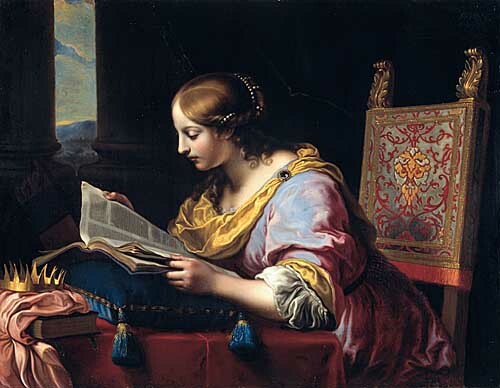 It’s not merely a matter of reading the same passages again and again and reminding ourselves of the standard meanings. To cast in iron the meaning of any parable or any passage is to stop growing. And to stop growing is death. We can wave the banner of faith, but if it is a faith that is stagnant, unyielding in its interpretation, then we are failing quite simply to honor Jesus’ words. Faith is messy as some have suggested. It is, and should be full of starts and stops, turns, flips, inquiry, doubt, doubling back, and throwing up our hands in confusion. We should get angry sometimes, we should find deep peace at others, joy often, confidence–in other words, faith involves the entire panoply of our emotions. Faith is a living thing. For we are in the process of a creation, one that is still ongoing, still unfolding. And we are deeply a part of that process. The very evidence that our world is not as it should be is all the evidence we need. It is not complete because we are not complete. Faith is work. It’s not easy nor always pleasurable. Talk to those of advanced spiritual growth and they will explain all the months and sometimes years of deep meaningless agony that must be fought through. To the degree that we attempt to avoid that, but painting a picture of faith as steady and unchanging, we contribute to the stalling of creation unfolding from us. We become the rocky soil, the path where fruitless sowing has occurred. It is like walking along with a handful of seeds and each step turns to concrete before us. We can sow seed all day long, and we will produce nothing. The vessel is sterile, and can generate no life. That is what seems to me is the fundamentalist. The fundamentalist has deeply erred in concluding that any question, any confusion about what the Word might mean, is not faith and thus must be avoided at all costs. Fear becomes the stick that guides the fundamentalist. We must realize that we are in process as believers. It is okay to say, I don’t know. It is okay to say, I can’t agree with that this seems to say, therefore, I must dig deeper to uncover its meaning. It is okay to conclude that perhaps the writer was wrong! But it is right to seek answers that satisfy one’s heart, because that is the truest location of good judgment. It is all about growth. Jesus called his disciples to grow out of their old thinking into new thinking, and in doing so, he shows us how to as well. Remember, on more than one occasion Jesus made clear that there was ever so much more to tell and to learn, more than he had time for in his short time in our world. So he taught us a method–simply love your God with all your heart, mind and soul, your fellow human being as yourself, and be servant to all. That is how we grow: by each day making a new effort to proceed throughout that day mindful of those directives.